We participate in many events all year long--come and bring the family. There are Rendezvous, shoots, Trade Fairs, special events, and more! Guests are always welcome at our regular meetings! Club picnic to be held at Island Lake Park in Shoreview, Minnesota in place of our August meeting. The club will provide meat and beverages. Attendees should bring a dish to share. We will eat at 6:30 pm. Please contact a club officer for more information. 3rd Tuesday of each month at 7:00 pm. Would you like us to advertise your event here? Contact us! Join us for our club events! For additional information about any event, please contact one of our club officers. All Winter Shoots and the Blanket Shoot are open to the public! All muzzleloaders welcome. Novelty and Paper Targets. Cash and merchandise prizes. Beginners are welcome! FREE instruction and coaching by TCMLC club members. No gun? No problem! Come anyway and borrow one of ours. Winter Shoots and Blanket shoot information on the Winter shoots page. 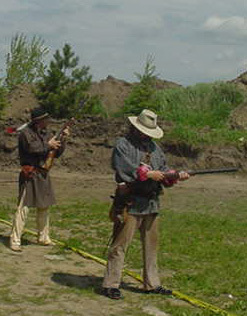 Are you interested in black powder shooting but don’t know how to start? Do you have a black powder firearm but aren’t sure how to use it? Have you thought about black powder shooting but do not know if you would like it and would like trying it before you invest in a firearm? Let us know if you are interested in attending a seminar. Email any officer.